Joining in with Stamping Ground again for the WOYWW. 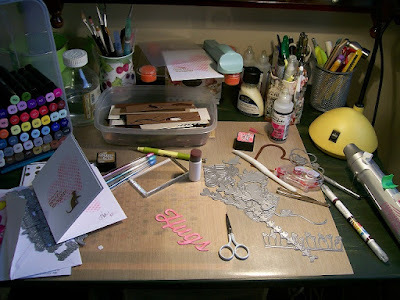 My desk has changed since last week, I am in the midst of making the card to the left for a crafting friend, and making a mess generally. 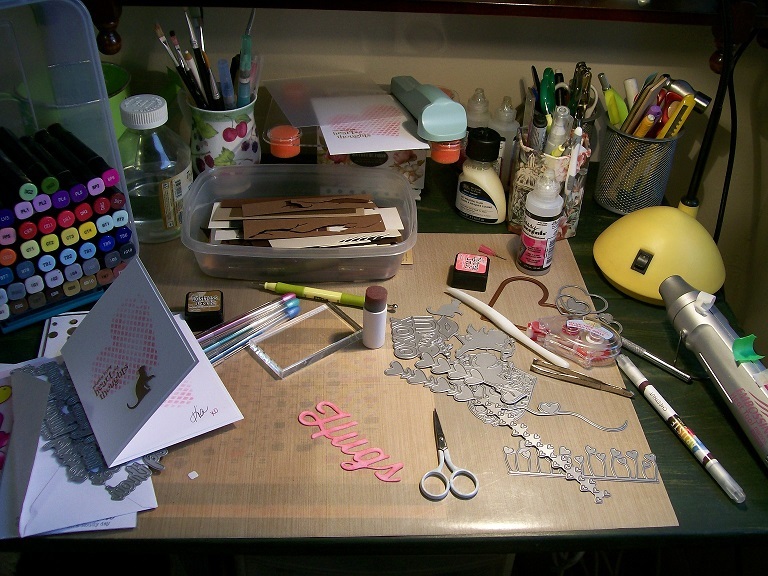 It is that time of year for thank you cards as well, so a busy time - how about U? Lots of fun dies on your desk. Yes - it is time for thank yous. And Happy New Years. Oh you have some nice dies there....those pots of flowers in a row, that's a lovely one! I'm sure your friend will love the card and the love in every inking! Your desk looks like lots of fun goes on there, Kia. Well done. As you saw, there isn't a great deal going on at my space currently - hopefully John and I will settle into a good routine as I care for him, so that I might get a bit of time trying out new ideas, playing with new tools, etc! I had a sneaky look back through some of your posts - you have a beautiful style to your creativity. I, too, am a fan of clean and simple. Thanks for the visit and the comments. You say you got stuck at my blog - hopefully in a good way.... Trust you had fun looking through the different pages to see all the sorts of things we have done over the years. I, too, have a friend who lives in Tywyn - it is about two and a half hours from here - further down the coastline, into Cardigan Bay - we are right up on the North Wales coast. Welcome to WOYWW, have fun with us all - we do send out a government health warning that it is addictive!! Be warned - your days will never be the same again. Hi Kia, Looks like you have new projects to do with those lovely dies. Thanks for stopping by my blog. You didn't put your number, but I found you. I love that card with the pink heart and black cat, definitely my cup of tea! You have some lovely dies too..I can see some deskers having die envy! !